Having fun and experimenting with food. This recipe combines some of my favorite things: Ben Franklin, Philadelphia, and pork. Yards, a local brewery, brews a beer from Ben Franklin's recipe called Poor Richard's Tavern Spruce. It's part of their Ales of the Revolution series, which are all delicious. I'd drink Tavern Spruce no matter what, since it's Ben's beer, but I also happen to love it. 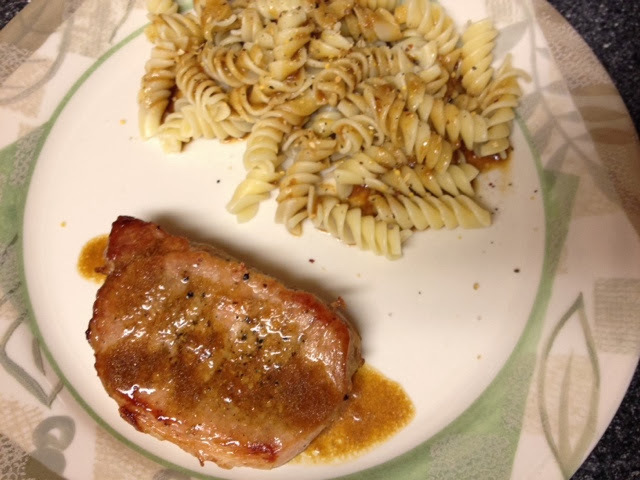 I had some pork chops I needed to use and wanted something other than a boring baked pork chop. A friend suggested marinating them in hard cider and brown sugar and making a glaze with the liquid. Sounds good, right? Well, I didn't have cider when I got home, but I did have Tavern Spruce. It made for some great pork chops. I know I disappeared for a while. Since it's mostly friends who read this blog, you'll know I was busy falling in love and starting law school. The bf is not much of an eater, which inhibits my cooking adventures, and my new kitchen is awful, but I'm going to try and blog a bit again here and there. It won't be anything too fancy or extreme, as most of my exciting kitchen gear is packed up in storage, but we'll see what I can come up with. I've taken a little break to finish my semester but I've got lots of posts to catch up on. I'll be back soon! My little sister sent me this idea courtesy of Cupcake Project. It's such a fun concept so I decided to make them for a friend to surprise her little girls with. I can't wait to hear about their reactions. 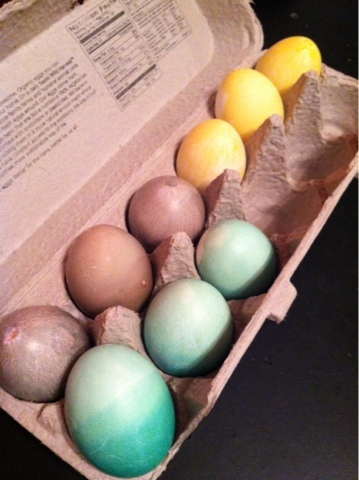 They didn't turn out as pretty as I'd hoped, but I think they'll still be fun. This post is brought to you by my sweet friend Kristin. By the power of the internets, she could make this in her home in Wisconsin and I can share it with you from my house in Philadelphia. I'm so excited that she'd share her recipe with us. I met Kristin after she moved to Philadelphia from Chicago and brought with her the deliciousness that is Italian Beef. Apparently, like cheesesteaks, there is a right way to order your sandwich. Your options include "hot and wet" and "dipped and sweet." Whoa, Chicago! I was browsing various food blogs one day, like I do, and came across this recipe for pistachio cupcakes. Yum, right? You use boxed cake mix, which I'm ok with sometimes. I love making stuff from scratch, but I also love stuff not taking forever. 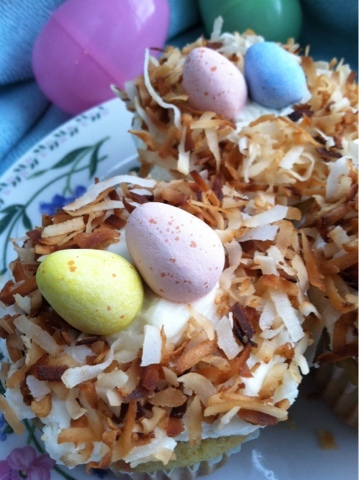 I figured Easter was great occasion to try this recipe out and make some adorable nest cupcakes. They're cute and really easy: the perfect combination for holiday baking. 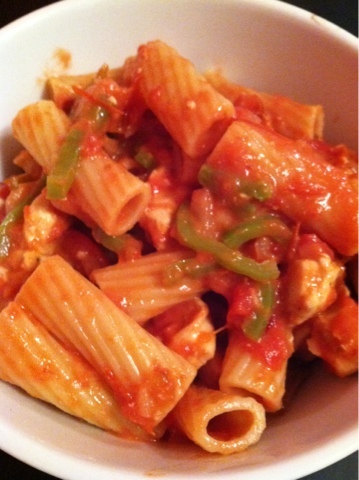 Chicken Riggies is Utica, NY's culinary claim to fame. It's rigatoni pasta in a mildly spicy blush sauce. It's up for debate who invented it with many Utica area restaurants taking credit. There are various versions. 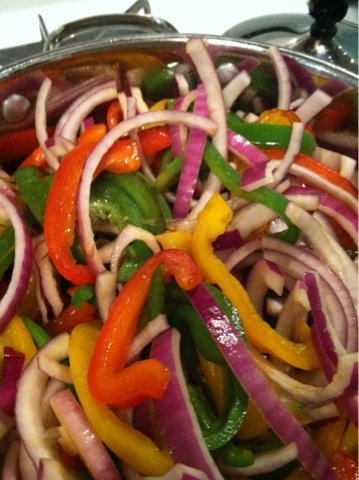 Some use sweet peppers where some use hot. Some add mushrooms and black olives. This is my favorite version.